How long before Alice’s “When Trucks Stop” scenario comes to realisation..? For all the talk about electric cars and renewable electricity, global oil production rose above 100 million barrels a day last month. For all the policy pronouncements to the contrary, the stark reality remains that our insatiable demand for oil, the products of oil, and all of the stuff that we transport with oil continues to drive up demand. There is, however, a big problem with that 100mbb/d figure that has yet to make it to the forefront of media and political debate. This is that not all oil is equal. This ought to be obvious enough to anyone living in my part of the world; where our economic history was shaped by the difference between the low-quality bituminous coal at the east of the South Wales coalfield and the high-quality anthracite coal in the west. The same issues are true for oil. On the one hand there is the sweet crude from fields in Texas, Libya, Saudi Arabia and the Gulf States; on the other there are the ultra-light condensates fracked out of the shale plays, the bitumen boiled out of Canadian tar sands and the high-sulphur toxic stew being extracted in Kazakhstan. 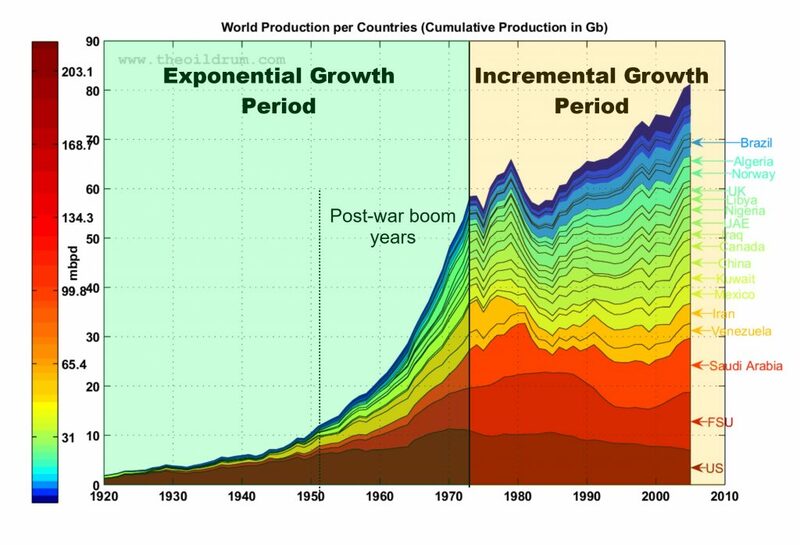 The former powered the unprecedented burst of global industrial expansion between 1953 and 1973. The latter are the dregs that humanity will have to get by on in the future. Not, of course, that this has been a problem so far. Those older oil fields are still producing – although many are past their peak – and with a little tweaking of the set-up, refineries can manage blends of heavy and light oils that approximate the sweet crude they were designed for. But there are limits to the tweaking. And as the world comes to depend increasingly on blends of too light and too heavy oils, refineries will not be able to supply enough of the fuels that we have built the global economy upon. Refining uses a combination of heat and chemistry to “crack” the molecule chains in the crude oil into various lengths according to the fuel being produced – butane and petrol (gasoline) are the lightest, kerosene and diesel in the middle and the heaviest are fuel oils used in shipping and building heating. And while you and I might value the lighter fuels for sparking up a barbecue or powering a car, for the global transportation system it is the middle and heavier fuels that are the most important. Most important of all, of course, is the diesel oil that powers all of the heavy machinery and trucks that are essential to the extractive processes that convert naturally occurring materials into the resources used to manufacture all of the stuff – including our food – which we consume. If ship owners switch fuels, we are looking at a global oil price above $200 per barrel; with diesel fuel being priced well above anything ordinary working people can afford for powering cars; and other fuels following close behind. This will impact British and American motorists far harder than those in Europe because of our systematic neglect of public transport and our insistence in building out into the suburbs. The broader question, however, is whether the current strategy of relying on a combination of fuel taxes and higher prices is a sensible approach to diesel shortages. Prices and taxes most often result in the misallocation of resources. This is most obvious when we contrast the suffering of millions of people in poorer countries against the frivolous consumption of the fortunate top ten percent of the global population living in the G7 states. However, because the growth in global energy consumption has allowed billions of people to experience an increase in their standard of living in the years since World War Two, the misallocation has appeared to be less urgent (to those in the developed states). In the event that strategic fuel production falls – as it appears to be doing – continued misallocation will accelerate the process of collapse. For example, most farmers depend upon diesel-powered machinery to maintain yields. Unfortunately, many of those same farmers are already struggling to remain in business despite already receiving subsidies from the state. And while there are some alternative power sources (batteries, biogas, hydrogen) for light vehicles, there is no means by which heavy diesel machinery and haulage vehicles can be substituted. Thus, if diesel prices rise, either food prices rise accordingly or (and most likely both) farmers go out of business. At the same time, however, the very richest one percent of the population is likely to regard the rise in diesel prices as a good thing since it will remove much of the road congestion they experience without preventing them from driving and flying. The alternative would be to develop and implement a rationing scheme based on the need to maintain critical infrastructure (including food production) even if this comes at the expense of limiting private vehicle use and severely restricting commercial air travel. In practice, unfortunately, our response to this looming fuel crisis is more likely to follow the pattern of our response to climate change; with powerful lobbies paying to distract our attention, large numbers denying the crisis exists, and most of those who acknowledge the crisis grasping at techno-utopian pseudo-solutions like electric cars and windmills. All I can say is hold onto your hats because when oil prices spike above $200 and our ability to consume collapses, we are going to witness economic and social dislocation on a scale that will make Brexit and the policies of Donald Trump that everyone seems so exercised about look trivial. As an aside, I currently have three French wwoofers, and you better believe they are right on top of collapse and planning all sorts of things to get ready, not least coming here to learna trick or two. I’m so proud of being able to teach them stuff….. If the embedded video doesn’t show English subtitles, they are available at youtube…. Another excellent post from the Consciousness of Sheep…….. a bit anglo-centric, but easily applies to anywhere not least Australia. Equating money with wealth is among the most dangerous delusions currently afflicting humanity. This is, perhaps, understandable given that so few people now have access to money in the quantities needed to improve their lives. Government, meanwhile, effectively lies when it points to the various pots of money that it has allocated to this or that infrastructure, entitlement or service. This is mendacious because money from central government is allocated as a block grant to local government and other public bodies. In total, these public bodies lack the income to fund their legal responsibilities. As a result, money that was theoretically allocated to provide for such things as mental health beds, fixing potholes and a host of other discretionary activities is actually deployed in firefighting the collapse of mandatory services like child welfare or social care for the elderly. The solution to this for many in the political sphere is to loosen the purse strings. Quite correctly, they identify the central flaw in the pronouncements of duplicitous politicians like Theresa May and Phillip Hammond; who tell us that “there isn’t a magic money tree.” Because… well… actually, yes there is. It’s called the Bank of England. 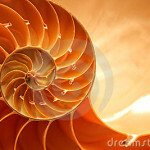 And were politicians to instruct it to do so, it can spirit into existence as much new currency as it likes. The conventional way in which central banks spirit money into existence is via the issuance of government debt. Government issues a bond (called a Gilt-Edged Security in the UK) which is auctioned to a closed group of banks and financial institutions. The central bank then spirits new money into existence and uses it to buy these bonds back. That new money then enters the economy via the financial sector. This, of course, is no more than tradition. There is nothing to prevent the central bank from conjuring new money out of thin air and then distributing it directly into the bank accounts of every citizen. Indeed, this is one of the points made by those who favour some form of Universal Basic Income as an alternative to the UK’s overly bureaucratic and increasingly ineffective social security system. The reason that money is not created in this way is simply that channelling it through the banking and financial system favours the wealthy and powerful at the expense of the wider population. Midway between the current practice of handing new money to the already wealthy – who get to enjoy it before inflation devalues it – and channelling it directly to the people, is the proposed creation of a national investment bank. Whereas feeding new money to the already wealthy serves only to inflate asset bubbles in unproductive areas like property, fine art and collectibles, an investment bank could provide funding for national infrastructure development. This, in turn, would provide new jobs as well as enhancing the productivity of the economy as a whole. The only requirement of any of these forms of currency creation is that the government removes sufficient money from the economy through taxation to prevent inflation running out of control. Herein, however, is the problem that has vexed governments down the ages. Exactly how much money does the government need to remove from the economy to prevent inflation? The current practice of giving new money to the already wealthy requires very little government action. The central bank practice of raising interest rates is considered sufficient. This is because, like taxes, debt repayment is a means of removing currency from the economy. Just as banks create new currency when they make loans, so currency is destroyed when loans are repaid. When the interest rate rises, an additional proportion of the currency in circulation has to be destroyed in order to pay the higher charge. Once governments start moving new currency directly into the economy – either through investment banks or direct transfers to people’s bank accounts – taxation has to be adjusted accordingly in order to prevent the money supply growing too high and causing inflation. The problem is that just as central banks cause financial crises by raising interest rates beyond the point where creditors begin to default; governments have a habit of causing crises by allowing too much new currency to be created. It is all too easy for politicians – who need to get re-elected – to promise new investments in popular services – without thinking about the impact of that new spending on the broader economy. In the 1970s, the impact of this kind of currency creation was so great that governments around the world handed control of their money supply to the banking sector; and passed legislation and entered into treaties (like Maastricht) that forbid direct government money printing (states are permitted to bail out banks, but not businesses or citizens). The inflation of the 1970s is explained in economics textbooks as being the result of profligate governments playing fast and loose with their national economies. The difficulty with that explanation, however, is that exactly the same money creation policies kick-started the greatest economic expansion the world has ever seen. The post-war Marshall Aid programme which printed new dollars into existence in order to rebuild the shattered economies of Western Europe and Japan, together with the spending programme of Britain’s Labour government (which didn’t receive Marshall Aid), paved the way for the twenty-year boom 1953-73. With western growth rates similar to those claimed by modern China, states using newly created currency to invest in and grow the economy became the economic orthodoxy for three decades. Having witnessed the austerity, depression and eventual rise of fascism in the aftermath of the First World War, economist John Maynard Keynes argued that the big mistake made in 1919 was for governments to return to the economic orthodoxy of the pre-war years. This had resulted in austerity policies at home and the imposition of reparations on the defeated enemy. What Keynes argued for was close to what the US delivered in 1945, when it realised its best protection against the Soviet Union was a prosperous, interconnected western bloc. Keynes’ proposition was straightforward enough: if you give newly created money to a wealthy person, they will exchange it for some form of unproductive asset – a house, a piece of art, a vintage car, etc. If, on the other hand, you give the same new money to a poor person, they will spend it all more or less immediately – on necessities like food, rent, fuel and clothing. In this way, new currency distributed to the poor would quickly circulate around the economy; stimulating growth. Keynes was correct in terms of money flows but wrong about growth. Indeed, there was a period in European history – the years following the colonisation of the Americas – when a sudden influx of new money (in the form of the gold and silver shipped back to Spain) had exactly the opposite effect. Without the influx of precious metals from the Americas, the Hapsburg Empire might have gone on to become the United States of Europe. Instead, it experienced a prolonged and ruinous period of inflation that resulted in internal revolt and division. In effect, the sudden influx of precious metals had the effect of devaluing the gold and silver (and money based upon it) already in circulation; manifesting as rapidly rising prices across the economy. More recently, excessive money printing (in order to inflate away reparation debt) in Germany resulted in the runaway inflation of 1924 that helped propel Hitler and the Nazis onto the world stage. This is the Keynesian Paradox. An economic policy (Marshall Aid) that patently kick-started the largest economic boom in history, also created the inflation of the sixteenth century and the stagflation of the 1970s. In the period since 1973, oil production has continued to grow; but growth has been linear. The result is that the rates of growth enjoyed in the west between 1953 and 1973 are never coming back. Indeed, much of the oil we are adding to the mix today is expensive; giving it a much lower value to the economy than the oil being produced in the aftermath of the Second World War. The economic expansion that Soddy correctly attributed to the fossilised sunlight locked up in coal deposits was to be multiplied a hundredfold by the oil-based expansion that followed the Second World War. And indeed, had we known that it was oil rather than one or other version of politics or economics that was responsible for our brief period of prosperity, our age too might have been merrier. Creating new currency – in this case the new precious metals from the Americas – into an economy that has outrun its energy supplies could only result in inflation because without sufficient energy there could be no economic growth. Only when new sources of energy – in this case, coal from the Severn Valley – can be brought into production does the economy recover and a new round of economic growth begin. When western states printed new currency into existence to rebuild their war-torn economies in the years after 1945, they did so while almost all of the planet’s oil deposits were still in the ground. Much of the new currency was invested into economic activities that required oil for manufacture and/or transportation. That, in turn, meant that a proportion of the new currency found its way into the accounts of the big oil companies; who used it to open up the vast oil reserves around the planet. It was this cheap, abundant reserve of oil that allowed for massive currency creation without generating inflation. It was precisely at the point when money creation overshot oil production that the inflation of the 1970s set in. 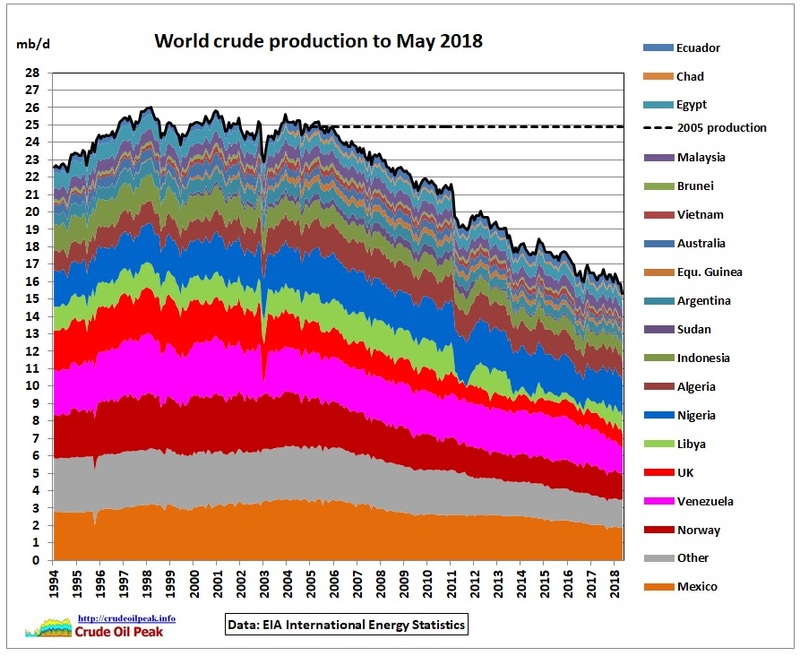 Fast-forward to the very different world of 2018: World production of “conventional” crude oil peaked in 2005. The resulting inflation – followed by the inevitable interest rate rises – triggered the worst financial collapse in living memory. 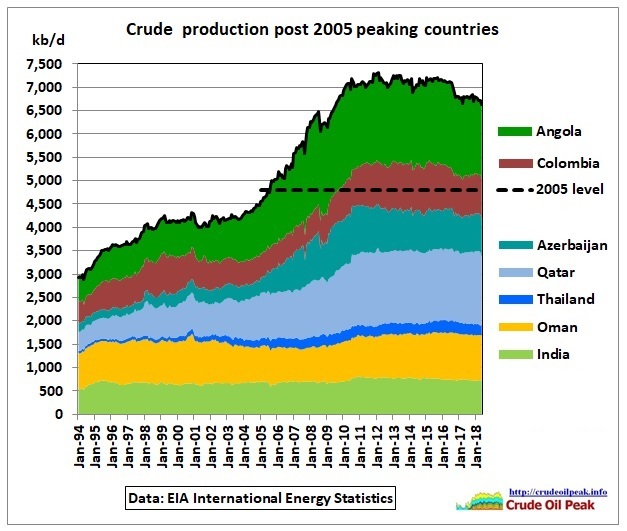 Oil production is still, just about, increasing; but only at great expense. Low quality and expensive oil from fracking, tar sands and ultra-deep water is keeping the economy going; but only at the cost of obliging us – businesses and households – to devote a greater part of our income to energy (either directly or through the energy embodied in the goods and services we purchase). Unlike money trees, there is nothing magical about oil (which, a handful of electric cars aside, still powers almost all of our agricultural, industrial and transportation vehicles and machinery). Even now, there is more oil beneath the ground than we have used so far. But most of what is left is going to stay in the ground simply because it is too expensive (i.e. it requires too much energy) to extract. Alternative energy sources do not really exist, other than by sleight of hand. Most often, this is done simply by conflating electricity with energy. But the crisis we face is primarily a liquid fuel crisis. As such, the electrical energy generated by a wind turbine or a nuclear plant is irrelevant. What has actually happened has nothing to do with ending our use of fossil fuels. Rather, states around the world have turned to alternative fossil fuels – coal and gas – together with renewables and nuclear to free up the remaining extractable oil for use in industry, agriculture and transportation. Oil consumption, however, continues to rise, because without it growth would end and the mountain of debt-based currency would collapse around our ears. This brings us back to the money question. There is a growing belief that the solution to our problems will come in the form of a switch from austerity economics to an expansionary policy based on distributing newly created currency via investment banks and/or universal basic incomes. This, however, is highly unlikely to succeed until or unless we find a means of massively increasing the energy available (at the point of use) to the economy to counteract the decline in affordable oil that is beginning to emerge (replacing unaffordable oil with unaffordable renewables doesn’t really count). Politically, the demand for an end to austerity is becoming irresistible. We already see its manifestation in Brexit, the election of Donald Trump and the rise of populist (right and left) parties across Europe. Around the world, the people have put the elites on notice that they will no longer tolerate an economy in which a tiny handful of kleptocrats continue to accumulate wealth via a rigged financial system while everyone else sees their standard of living plummet. The mistake, however, would be to assume that simply printing currency will solve the problem. Without useable energy to back it up, new currency is worthless. Its only role is to steal a fraction of all of the currency already in circulation. This may have small benefits if channelled to ordinary people, since it will be the accumulated currency of the wealthy that is devalued the most – a kind of hidden tax. But the ensuing price increases are far more likely to be experienced by those at the bottom of the income scale; as their ability to pay for necessities is rapidly eroded. The crisis of our age, then, is not to pick the fruit of the magic money tree; but to discover the location of the magic energy tree whose fruit has fertilised the money tree for the past 250 years. Sadly, that magic (fossilised sunlight) energy tree has shrivelled with age. We may never see its like again. The largest shale oil producer in the Permian spent $264 million more than they made from operations drilling 63 new wells in the Permian and only added a net 9,000 barrels per day of oil equivalent. Now, how economical is that??? While the U.S. reached a new record of 11 million barrels of oil production per day last week, the top five shale oil fields also suffered the highest monthly decline rate ever. This is bad news for the U.S. shale industry as it must produce more and more oil each month, to keep oil production from falling. According to the newest EIA Drilling Productivity Report, the top five U.S. Shale Oil fields monthly oil decline rate is set to surpass a half million barrels per day in August. 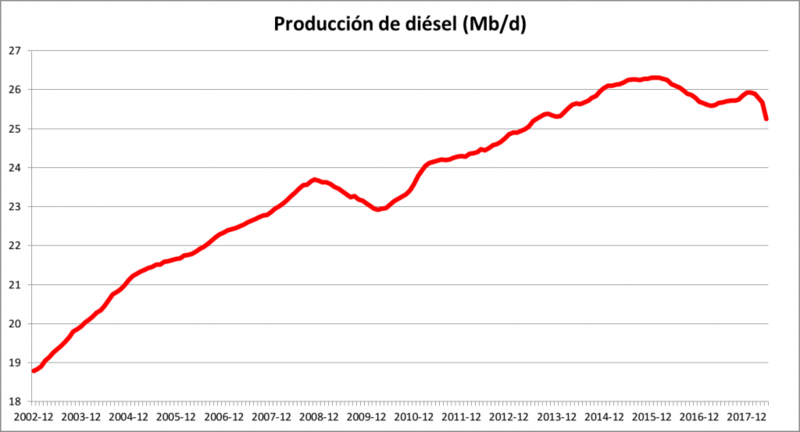 Thus, the companies will have to produce at last 500,000 barrels of new oil next month just to keep production flat. The figures that are shown above the UP arrow denote the forecasted new production added next month while the figures above the DOWN arrow provide the monthly legacy decline rate. For example, the chart on the bottom right-hand side is for the Permian Region. The EIA forecasts that the Permian will add 296,000 barrels per day (bpd) of new shale oil production in August, while the existing wells in the field will decline by 223,000 bpd. If we add up these top five shale oil fields monthly decline rate for August will be 503,000 bpd. 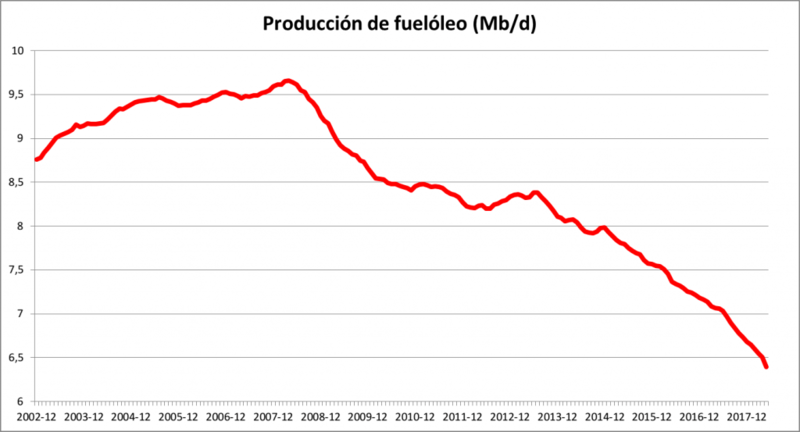 Thus, the shale oil companies must produce at least 503,000 bpd of new oil supply next month just to keep production from falling. 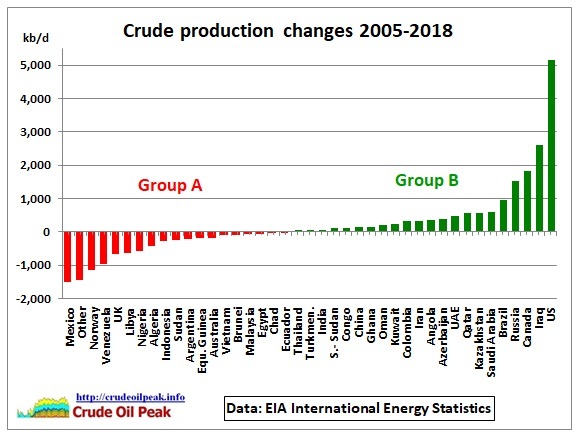 And, we must remember, this decline rate will continue to increase as shale oil production rises. Producing 260 thousand barrels oil equivalent per day (MBOEPD) in the Permian Basin, an increase of 9 MBOEPD, or 3%, compared to the fourth quarter of 2017; first quarter Permian Basin production was at the top end of Pioneer’s production guidance range of 252 MBOEPD to 260 MBOEPD; as previously announced, freezing temperatures in early January resulted in production losses of approximately 6 MBOEPD; Permian Basin oil production increased to 170 thousand barrels of oil per day (MBOPD); 63 horizontal wells were placed on production. Pioneer reported $554 million in cash from operations and spent $818 million drilling and completing oil wells in the Permian and a few other locations. Thus, Pioneer’s Free Cash Flow was a negative $264 million. However, Pioneer spent an additional $51 million for additions to other assets and other property and equipment shown right below the RED highlighted line for a total of $869 million in total CapEx spending. Total net free cash flow for Pioneer is -$315 million if we include the additional $51 million. Therefore, the largest shale oil producer in the Permian spent $264 million more than they made from operations drilling 63 new wells in the Permian and only added a net 9,000 barrels per day of oil equivalent. Now, how economical is that??? How long can this insanity go on?? Of the ten shale companies in the chart above (in order: Continental, EOG, Whiting, Concho, Marathon, Oasis, Occidental, Hess, Apache & Pioneer), only three enjoyed positive free cash flow, while seven suffered negative free cash flow losses. The net result of the group was a negative $455 million in free cash flow. Even with higher oil prices, the U.S. shale energy companies are still struggling to make money. So, the question remains. What happens to these shale oil companies when the oil price falls back towards $30 when the stock market drops by 50+% over the next few years?? And how is the U.S. Shale Energy Industry going to pay back the $250+ billion in debt? ?